American Eagle is a premium apparel brand that has over 1,000 brick-and-mortar locations around the world. With a consumer base full of tech-savvy Gen Z shoppers, delivering a seamless experience across both online and physical stores is critical to the brand’s success. 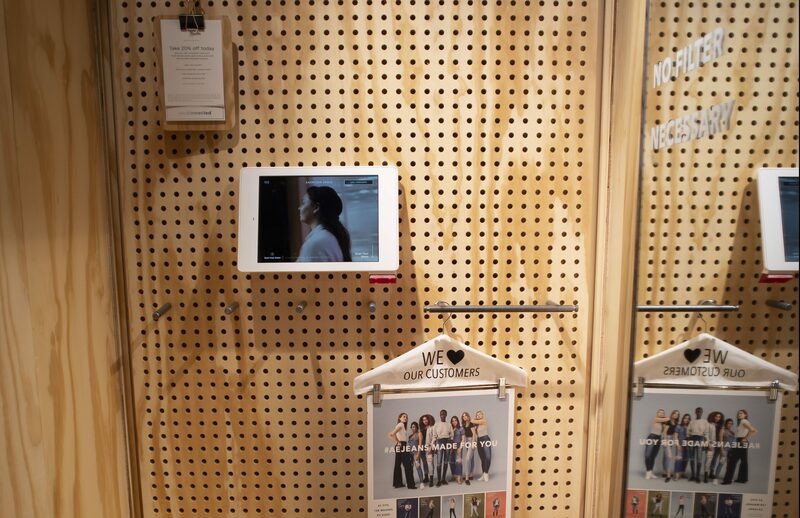 To enhance the brick-and-mortar experience, empower associates, and enable a 360-degree view of in-store shopping behavior, the American Eagle innovation team built an Interactive Fitting Room around Aila’s iPad-based Interactive Kiosk, which comes equipped with proprietary TrueScan technology. The Interactive Fitting Room powered by Aila puts full digital commerce capabilities in shoppers’ hands from within the physical fitting room stall. It also delivers rich data about customer behavior to the retailer. This information is critical to further enhancing in-store experiences and optimizing areas like associate productivity and stocking. Requests made on the Interactive Kiosk trigger a notification on handheld associate devices, which store associates use to claim, fulfill, and then mark requests as completed. This gives associates improved visibility of shopper needs, empowering them to provide exceptional customer service. American Eagle’s Interactive Fitting Rooms are currently deployed in key markets such as New York City, Boston, San Francisco, Las Vegas, and Pittsburgh as part of an ongoing roll-out to the brand’s new flagship stores.